Many of you know about our Emmy winning TV show Equitrekking. We're excited to celebrate the one year anniversary for our new business EquitrekkingTravel.com! It's been a busy year. Over the course of our first year, we've sent travelers to Costa Rica, Ireland, Hawaii, Turkey, Jordan, North Carolina, Alberta and beyond and gotten great reviews. Many people have chosen to go on the special trips that were created based on Equitrekking episodes, like the Jordan Bedouin Trek & Classic Tour, Maui and the Big Island equestrian vacations, Irish Medieval Trek, Cappadocia, Turkey equestrian vacation and more- vacations that are exclusive to EquitrekkingTravel.com, meaning you won't find them anywhere else. Well before our launch, we looked for the right travel agent to match travelers to trips and be able to take care of all of their other needs in addition to their horseback riding vacation, like good airfare deals, rental car and vacation extensions like bicycle tours, spa retreats and city visits. 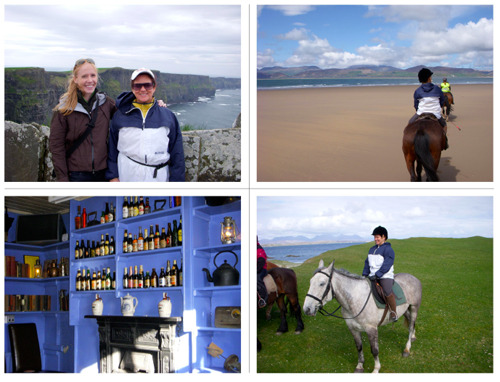 We were excited to hook up with Julie Snyder, Equitrekking Travel's Preferred Provider of Travel Services, who has more than twenty years experience as a travel agent, is a member of the network of the world’s finest travel agencies- Virtuoso- and is an avid equestrian. It also didn't hurt that this was Julie's dream job. Our team traveled to Julie's home area of La Crosse, Wisconsin to get to know her better. I was a little jealous of Julie's beautiful indoor ring at her hunter jumper barn and great trails for riding and happy to see we shared the same passion - horses and travel! 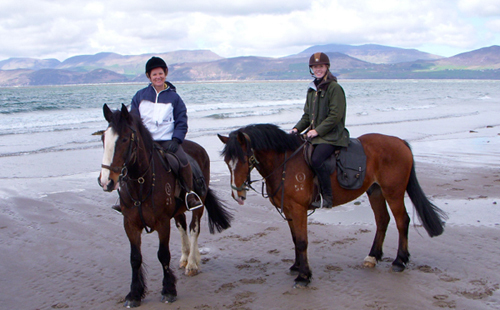 Soon after, Julie and I traveled on a whirlwind trip to Ireland to ride horses in every destination that we feature on EquitrekkingTravel.com. What better way to really get to know someone then to travel with them! Julie then ventured to Costa Rica and North Carolina to test out more of the EquitrekkingTravel.com vacations. It's been a busy year. 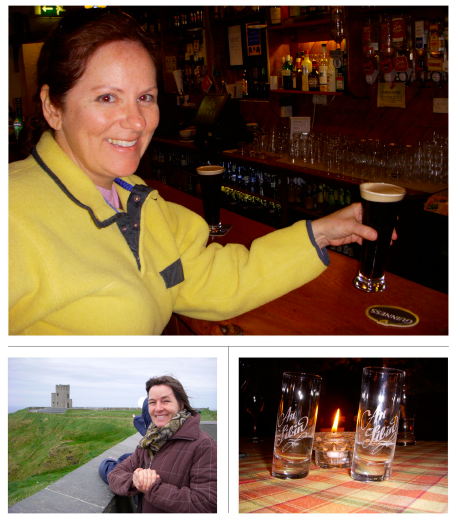 Here are some photos from our amazing Ireland trip to commemorate a year in business. The Cliffs of Moher on the Galway & Clare Riding Adventures, Kerry's beaches, the Connemara Trail, a cool Irish pub- Lily Finnegans pub in Carlingford, Ireland- in Niall's hometown for the Medieval Village Trek. The Cross Country Course at Mount Juliet Estate. 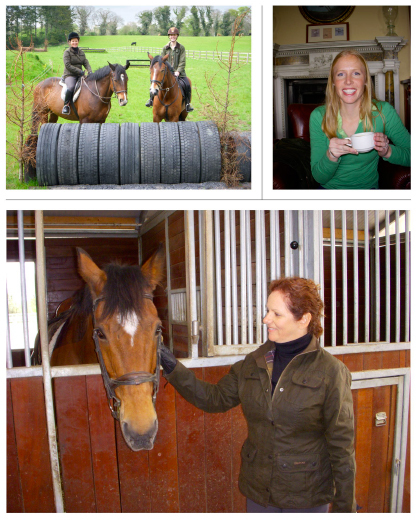 I enjoy high tea, and Julie decides she wants to take home an Irish Sport Horse. 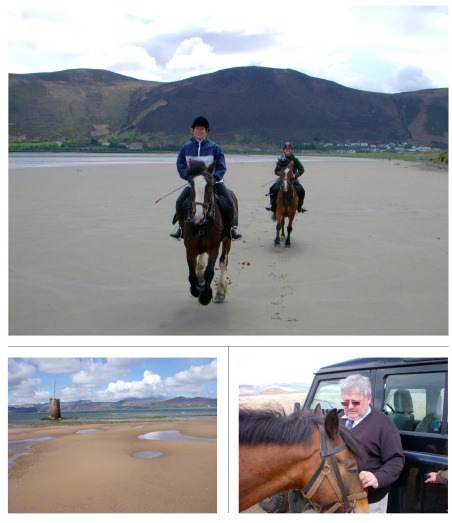 While we loved the mountains on the Kerry Mountains & Beaches Trek, you can't get much better than galloping on a beautiful wide beach. Donie O'Sullivan, who always has great stories, served as our wrangler. 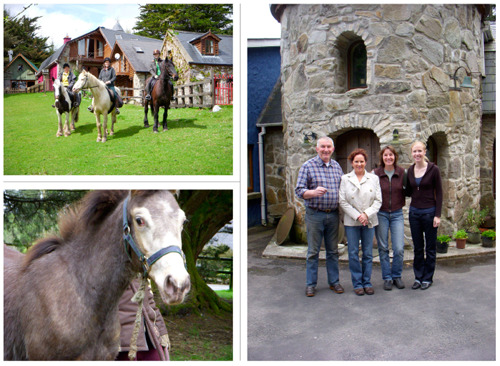 Julie and I felt right at home in the 300-year-old farmhouse in Country Clare on the Galway & Clare Riding Adventures. Our hosts Nicola and Bertie took us to the local pub, riding through the beautiful, horsey surrounding area and to the coast. What a dream! I've interviewed legendary horseman Willie Leahy twice for Equitrekking. He's a true character, so I was excited to have Julie meet him. We went riding on Connemara's beaches on the Connemara Trail with a crazy group of Swiss riders on their umteenth trip to ride with Willie. 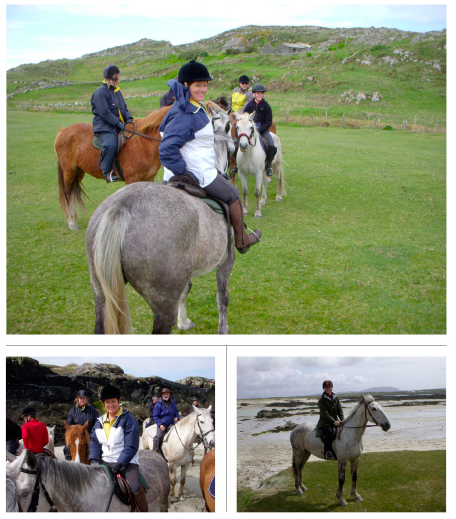 It was a full day of fast races and gallops on the beach on ultra-cool Connemara ponies. A trip to Ireland is not complete without a trip to the pub. Julie is toasting me in this photo, but here's a toast to you Julie. Thanks for a great year! Learn more about Julie and check out EquitrekkingTravel.com and Equitrekking in the news! Contact Julie to find your next equestrian vacation and join Club Equitrekking for discounts on equestrian vacations with Equitrekking Travel, an equestrian magazine subscription, the Equitrekking hat, DVD samples and more!